“Surgery” is usually somewhere near the bottom of anybody’s list of fun ways to spend an afternoon. We get it. However, if you’re suffering from a painful neuroma and conservative care has not managed to eliminate your discomfort, surgery may be your only good option. You won’t need a time-consuming (and expensive) hospital stay. We perform the surgery as an outpatient procedure. You won’t be stuck in all day. Most neuroma surgeries are finished in just under a half hour, from initial incision to patching you back up. Sometimes it can take longer depending on varying factors (for example, if you choose to undergo general rather than local anesthesia), but it’s usually quite simple. You probably won’t be off your feet for weeks on end. 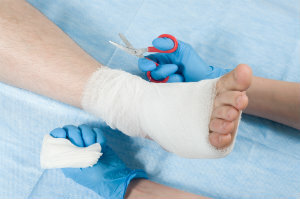 In fact, if the incision is made on the top of the foot (as it usually is) you’ll probably be able to walk right out of our office after the surgery, and resume weight-bearing activities (as you can tolerate) immediately. You will probably need a special walking shoe for at least the first few weeks to deal with swelling, but most people can return to wearing normal shoes within a month or two. While this is a bit of an overgeneralization, there are two basic procedures we can pursue. The first method, preferred by most, is called decompression surgery. The goal here is to relieve mechanical pressure on the affected nerve by cutting one of the transverse ligaments, which in turn can significantly reduce or eliminate painful symptoms. In time, the damaged nerve may begin to recover healthy function. The other option is to remove the damaged nerve entirely. While this gives you the greatest possible outcome in terms of pain relief, it is more likely to result in permanent numbing of the affected toes. We know surgery can be scary, but when your neuroma pain just won’t go away, it’s usually the best decision you can make. To schedule a consultation appointment with Dr. Harvey Danciger at our Palm Desert, CA office, contact us online, or call at 750-568-0108 today.